I've previously mentioned my love of the website Shorpy, with its cleaned up and sharpened historic photographs. I visit almost daily. One thing I like to look at in the image is what people were up to when they didn't know they were being observed, and particularly how they walk, stand, or lounge. These photographs are almost all urban photographs, so I am probably missing some great rural ambling. But here are some of my favorites, pointing out various individuals of interest. My computer wallpaper is a rotating selection of Shorpy images, these among them. Each picture links to the much larger image on the Shorpy website, as they request. Most of those images are very high resolution, and can be further expanded. Read the comments. Shorpy has some of the most attentive and well-informed commenters around, if a bit overly concerned with makes of automobiles. Today I'll cover Chicago and Boston. Later, some places in New York. For some reason, my eye has been caught most often by people near where I grew up, in Chicago. Here, for example, is the Wabash Avenue L in 1900. 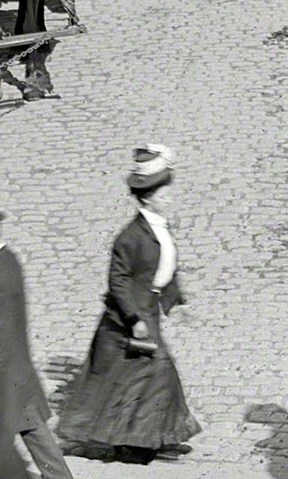 It seems to be mostly about rails and facades, but an attentive commenter picked out this lady. This is probably not the main character of a story, but a supporting player who rivets the attention whenever she's onstage. Where did she go once she strode off the edge of this photograph? Also in Chicago, this time under the L, in 1940, are people dressed in the much lighter summer clothes of four decades later. My eye is instantly riveted by this lady, who really knows how to make getting from one place to another an adventure. Her way of moving is even more impressive when you reflect that she's doing it in heels across paving stones and streetcar tracks. And, finally, a scene before the war. Another summer afternoon, just a year later than the previous one, right after work. You see women in summer dresses, older men in hats, younger men bareheaded. Everyone's going somewhere, but in no rush, so I haven't picked anyone out in particular. This shows the end of Bromfield Street in 1908, right where it joins Washington Street. The street looks pretty much the same today. Marliave is still there. That's the Granary Burial Ground at the far end. It looks like the morning commute. My eye is always caught by this lady, hustling to work, not particularly enjoying herself. I've never figured out if that's her lunch she's carrying, her purse, or a beer stein. He, on the other hand, doesn’t have to worry about getting there on time. They’ll wait. Meanwhile, the men look more relaxed. 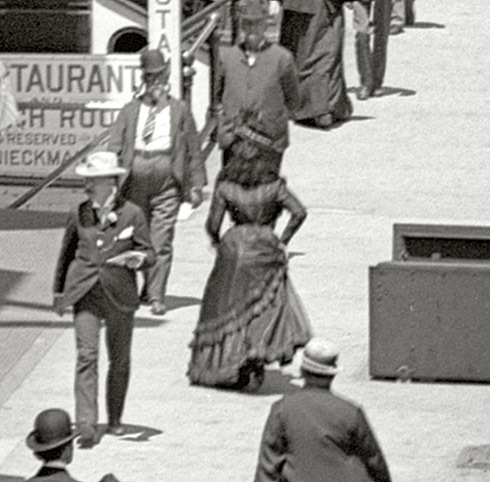 This older gentleman, very well dressed, is looking at the scene, while the two younger men behind him, saunter toward Tremont Street, one with his hands in his pockets. Then here is what is now Dewey Square, in front of South Station, 1905. The Station has lost much of its bulk over the years, so each wing is shorter, and the elevated train is gone. I actually like elevateds, but most people find them noisy and unsightly. If they're paid for and are working, I'd keep them. Boston went through a lot of effort to bury theirs, and at great expense, though this one was gone long before that. 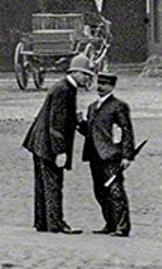 Lots of people walking in various ways, but I like these two, who, yes, are standing, not walking: a cop in a classic custodian helmet (now associated only with Keystone Kops) and a shorter guy with something to say, standing on a slight slope so that he has a comic look perfect for one of those Mack Sennett two reelers.